I'm posting only two of my cards right now. The other two cards I did are going to people who read my blog-so I'll post them later. This one is made with a digital stamp that I found here. I used the same background as the freebie but changed the color and then put the image on top and then printed it. I colored it with copic markers. I tried shading and all that but the colors looked so light (pink instead of red, for example) so I just colored it solid. The markers I used (forgot to take a picture) are C5, G07, G17, R17 and Y38. I printed the image on shimmery cardstock but you can't tell from the picture. It's shimmery though. I used some Stampin' Flock on the white parts of the hat. 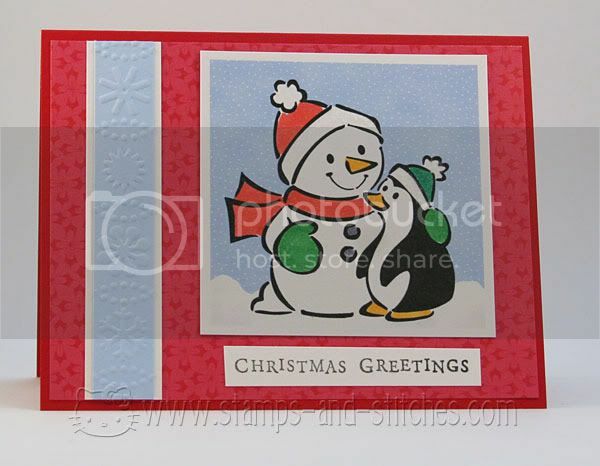 Cardstock and patterned paper are from Stampin' Up and the Christmas Greetings stamp is from..I think Hero Arts. Embossing folder from Cuttlebug. 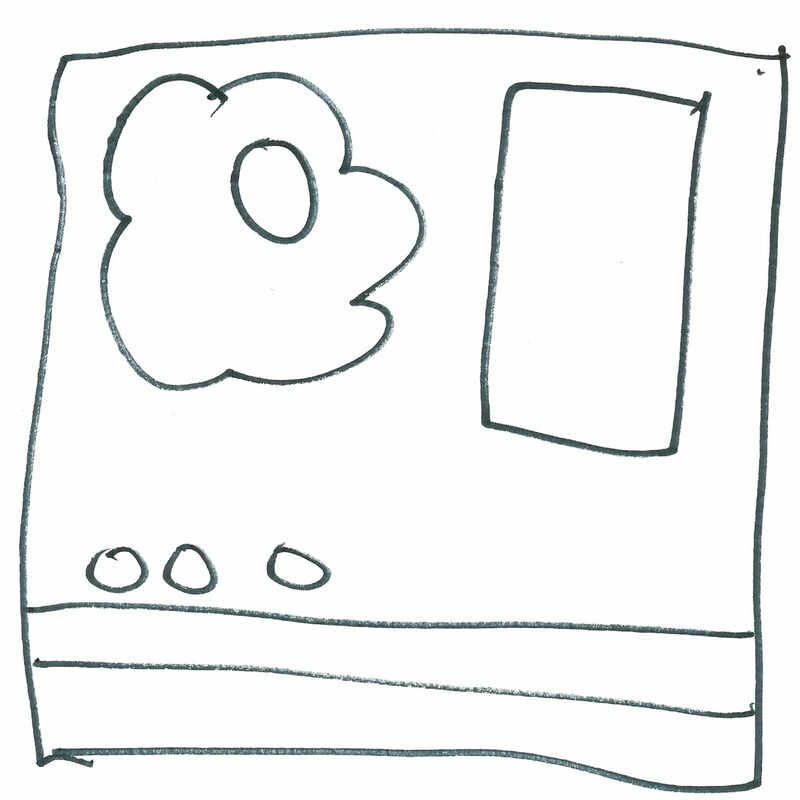 For this card I used Aly's sketch shown here, turned on its side. I didn't have room for the 3 dots so I left them out. I didn't want to make square cars since I don't have enough envelopes that size and shape. This next one was made using a digital kit by Crystal Wilkerson. I printed the patterned papers onto some cardstock and then cut them up just as I would regular patterned paper. The tree and sentiment were printed on shimmery cardstock. I cut the tree out and glued it to the oval (which is SU vanilla cardstock). I also used nestabilities and my SU scallop border punch. 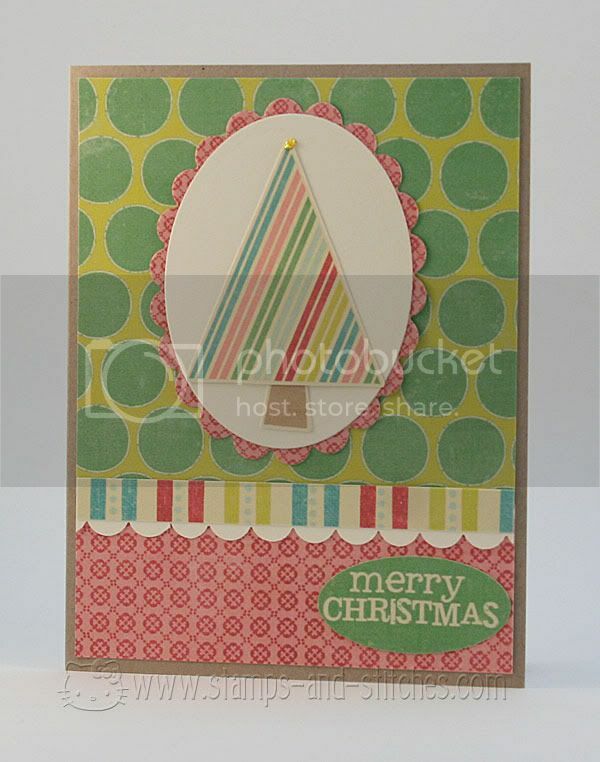 Kraft cardstock is from Stampin' Up. I used stickles at the top of the tree. Cute little penguin! Thanks so much for the RAK card! That was sooo sweet of you! These cards are so pretty, just like the one you sent me. It was such a nice surprise! Thank you! I love both of these! I think I especially like the pink one...less traditional so it stands out more! Thanks for the card as well! I sent one out to you early in the week...confession...it is a photo card, but you know you wanted to see my real face and not a post-it, didn't you??!! The second one (with the tree) is so cute. I have been wondering about the digi paper, but yours looks wonderful! Great job on Aly's sketch, too!